How can I become a member of ECN? Individual members are typically consultants, researchers or very small firms (e.g. self-employed professionals). These members are typically interested in being contacted by larger firms to participate in project teams. Expert members are allowed to search all other experts; Associates do not have this search capability. Corporate members are typically organisations: consultancies, research institutes, chambers of commerce, universities, etc. These members are interested in both finding individual experts to staff projects, but also in searching for procurement opportunities, searching for other corporate members to develop consortia, etc. The free membership options have restricted access to the ECN system in each case. Please be aware of these limitations before making your choice. You can view the membership options in more detail on our Sign Up page. Alternatively, please Contact Us for more information and a personalised consultation. * A 15% Value-Added Tax charge applies to certain clients. What are Sectoral and Functional Keywords? A Sectoral keyword describes a segment of activity, for instance "Tourism", "Vocational Education and Training", "Agriculture". A Functional keyword describes a function implemented by a service provider, for instance "Marketing Planning", "Export Promotion", "Training Needs Analysis". ECN has developed an extensive database of keywords, which you can use as meta-tags to describe your profile or to search for opportunities. You can enter your own keywords, or use the auto-complete function in the fields provided. This helps the ECN database platform determine search results. If you would like to recommend some additional keywords, please Contact Us. Subcontracting Offers: What are they, and how do I add one? Individual subcontracts are for individual experts. These are usually posted for key experts, translators / interpreters, project accountants or other projects where the required expertise is for an individual expert. Corporate subcontracts are for companies which provide collective expertise. These are usually posted for the provision of services such as audiovisual support, translation (if there are multiple languages involved), conference services, etc. but can also involve specialised services such as market research, customer interviews, etc. If you are in doubt about what kind of subcontracting offer to post, try to think in terms of the people you are trying to contact: are these likely to be individuals, or companies? Bids: In a bid, the recruiting organisation is looking for experts to include in a bid, proposal, or tender. In other words, they do not yet have the project. In this case, the sub-contractor should not expect an immediate answer, and should evaluate his or her chances accordingly. Subcontracts for bids will typically ask the expert for a Statement of Exclusivity and Availabilty. Contracts: in a contract, the recruiting organisation is looking for experts for a project which is already underway. If you are a subcontractor, this means that the offer may be more serious, and require immediate engagement. We ask all ECN Members to respect the rules of our network. Please post subcontracts with as much detail as possible, so the respondent has as much information as possible at their disposal in order to make a decision. Fill in specific information on the contract: how many days are involved, where is the assigment, what's the remuneration rate, what criteria will you use to make a selection? ECN accepts no liability or responsibility for Subcontracting Notices posted by members. Although we will edit all offers for correct language and information prior to release, we cannot investigate the seriousness of each organisation or individual who posts or responds to a subcontracting offer. If you have further questions on subcontracting, please Contact Us. How can I set up automated Tender Alerts? If you are already a subscriber, click on your name (the blue hyperlink). If you would like to set up a new account, press "Add". Step 3: Choose the frequency and format you would like for receiving the notifications. You can choose each notice when published by ECN, or opt for a daily or weekly digest. Choose also the email format you would like to use. Step 4: Choose the countries or regions you are interested in. You can also simply choose „all“. Step 5: Choose the business sectors you are interested in, or simply write in „all“. 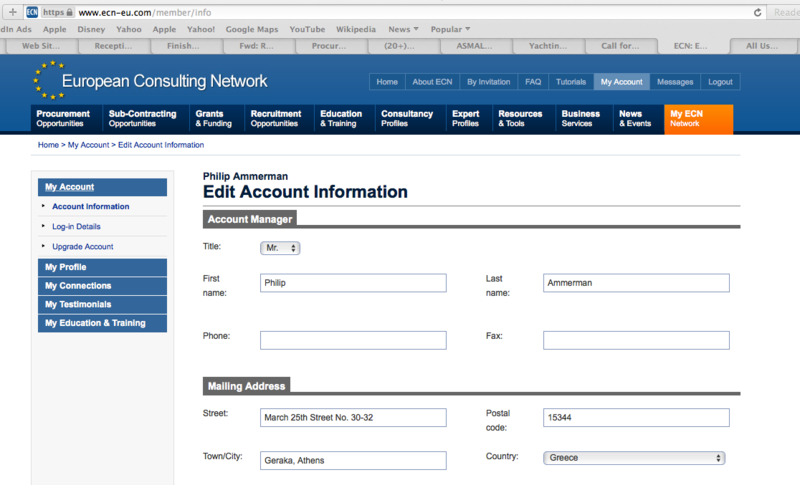 Step 6: Choose the business functions you are interested in, or simply write in „all“. Press „save“ in order to ensure your choices are saved. We suggest choosing „all“ for steps 5-6, as we are still in the process of fine-tuning the sectoral and functional keywords on our site. You can follow the same procedure to set up new accounts for your staff: each Executive Member has the option to set up accounts for up to 5 staff members in the same company. How can I upgrade my account to Expert or Executive Member? If you are an Associate or Professional Member, you have restricted access to ECN content. The detailed list of membership types and access levels can be found here. 1. Log into your existing ECN account. 4. Continuing the dialogue box to subscribe. Please contact us for any questions or issues.